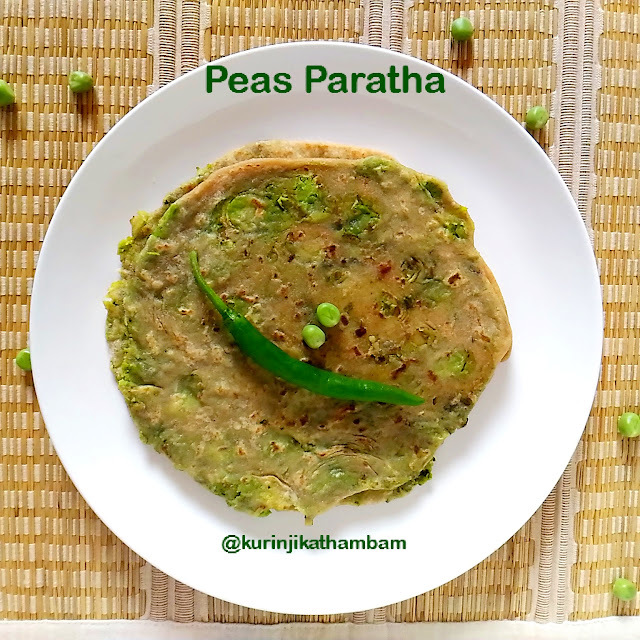 The greenness of the Peas Paratha makes it very tempting to have a bite. Peas Paratha is one of the best Paratha variety I have made. 1. Pressure cook the peas with ¼ cup of water for 1 whistle in a high flame. 2. 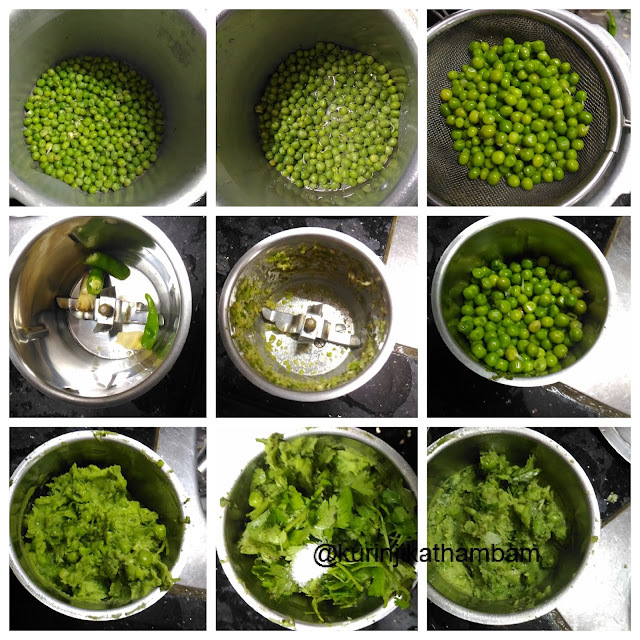 After pressure has gone, strain the water from the peas and allow it to cool down completely. 3. 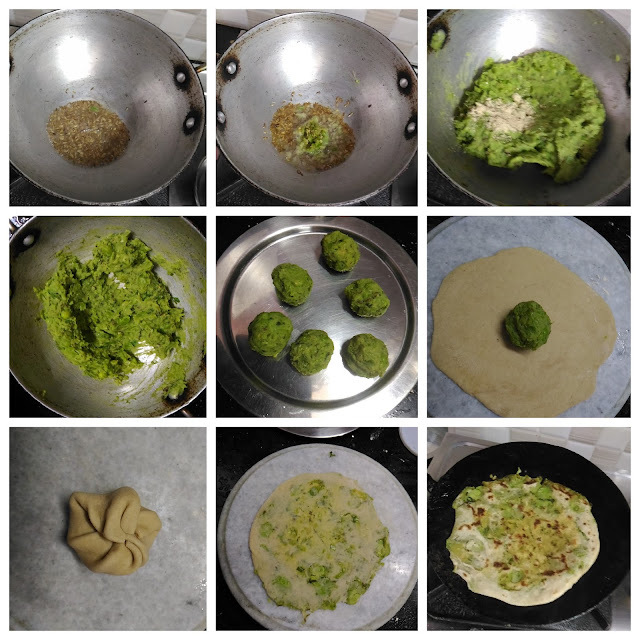 Grind the green chilli and ginger into a paste using the dry mixie. Take it out from the jar and keep it aside. 4. Now add the peas (from 2) and grind them into a coarse paste using the same jar. 5. Then add coriander leaves and salt. Again grind them into a coarse paste. 6. Heat the oil in a pan, add cumin seeds and wait for popping. Add the ground green chilli paste ( from 3) and fry for a minute. 7. Then add the peas paste ( from 5) and amchur powder. Mix them well and sauté until the mixture becomes thick. 8. Allow it to cool down completely and make lemon size balls from the mixture. But the stuffing ball should be smaller than dough ball. 9. Now divide the dough (from I) into a lemon size balls. Now dust the dough ball and roll it into a small circle. Keep the stuffed ball in its center. Then bring the edges to the center. 10. Press them gently, again dust the stuffed balls and roll it carefully. 11. Heat the tawa and transfer the paratha, sprinkle the oil and cook both sides till the black spots starts.